Not all car accidents will require a victim to hire a lawyer. In fact, it is perfectly legal in Tennessee for victims to file injury lawsuits, and even accept settlements from an insurance company, without hiring an attorney. However, there are circumstances when victims should have an experienced crash lawyer working on their behalf. When Should I Consider Hiring an Attorney for My Crash Case? If you have suffered minor injuries and are getting enough payment from an insurer to cover all of your medical costs and property losses, you may not need legal representation. In most other cases, however, it is a good idea to at least consult with an accident attorney to ensure you will receive enough to cover all of the damage caused by the accident. You suffered significant losses. Two of the biggest causes of financial difficulty after a car accident are medical expenses and lost wages. An attorney can help you total the amount of compensation you will need for hospitalization, surgery, physical rehabilitation, prescription medications, future medical care, and the time you have missed from work in order to ensure you are not out of pocket for these expenses. Your insurance won’t pay. Once of the biggest benefits of having an attorney on your side is having your lawyer deal with an insurance company on your behalf. Insurance companies are financially motivated to pay out as little as possible for each claim. If there is a dispute over who is at fault for the crash, the limitations on coverage, or a disagreement about how much of your costs will be covered, an attorney can review your policy to make sure you will be properly reimbursed for the crash. You won’t be able to go back to work. If you are not sure if you will be able to return to your old job or do another form or work, you should definitely involve an attorney in your case. A lawyer can be instrumental in getting you an amount for your crash claim to compensate you for your future loss of income. Your accident involved a minor. In Tennessee, any injury settlements involving minors must be approved by the court and may require witness testimony if the settlement amount is greater than $10,000. The court may choose to release the funds to the child's guardian or require it be deposited with the court until the child turns 18, so an attorney may be vital in getting you compensation for your child as soon as possible. You have permanent effects or ongoing costs. A case where injuries are expected to heal without complications is very different from one that has caused permanent difficulties. If your injury will not heal in a way that will you restore you to your pre-accident state, you may need an attorney to estimate the future losses caused by the injury, including loss of earning capacity, lost quality of life, and pain and suffering. A defective part caused the crash. If a tire blowout, malfunctioning accelerator or brake pedal, or other faulty car part caused the accident, it is best to speak with an attorney as soon as possible. These cases may qualify you to file a lawsuit against the manufacturer of the defective component or vehicle to hold the maker accountable for your economic and non-economic damages, and may include an award for punitive damages. The other driver was doing something negligent. If you suspect that the other driver caused the crash, you should consult with an attorney to determine whether the driver was negligent. Negligence can take many forms, including texting while driving, speeding, or running a red light, and an accident attorney can help gather the proof you need to show that the other driver was at fault. Someone was killed. If a child, spouse, or family member was killed as a result of the accident, you may be able to file a wrongful death lawsuit. An attorney can pursue the claim to get you the amount you deserve for the deceased’s medical costs, funeral and burial expenses, and lost future income, but also the survivors’ emotional pain and suffering. Even if victims can settle their claims by themselves, there is no downside to speaking with an attorney about the case. At GriffithLaw, we provide injury consultations at no cost to the victim, and our legal fees are paid with a portion of the settlement we secure for you. The time limit to bring a case is only one year from the date of injury, so we recommend that you contact us as soon as possible. To learn more about your rights, simply fill out the short contact form on this page or request a free copy of our book, The 10 Worst Mistakes You Can Make With Your Tennessee Injury Case. Am I Required to File a Lawsuit After an Injury in a Car Wreck? 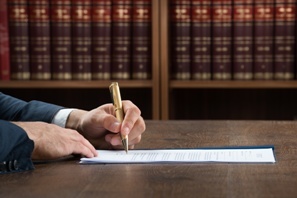 Do I Need an Attorney for My Personal Injury Claim?